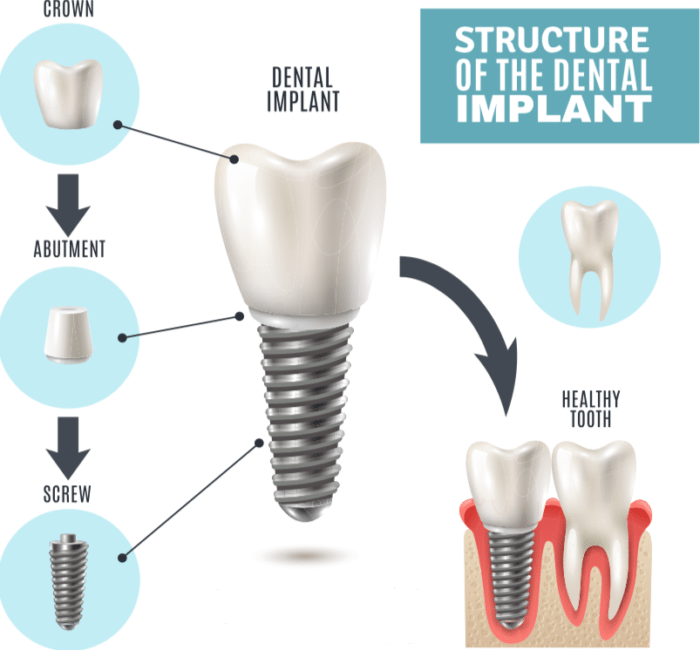 While the placement of dental implants was attempted for many decades in the twentieth century, it was not until the 1950’s that discoveries were made that laid the foundation for modern dental implant reconstructive surgery. 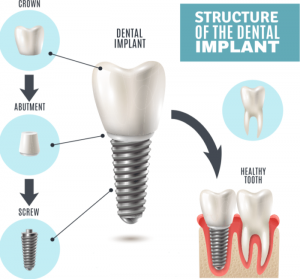 Dental Implant – What are the Benefits? Aside from dental implants, one of the other methods of replacing missing teeth is through the placement of removable full or partial dentures. However, since dentures sit on top of the jawbone and gums, continuous shrinkage of the jaw bone alters the fit of the denture, resulting in slipping or rocking of the dentures. Exposed nerves and irritation of the gum tissue may add to the discomfort. Dental implants eliminate the pain and discomfort of removable full or partial dentures. Dental Implant supported replacement teeth are like natural teeth because they are anchored securely to your jawbone. Gum irritation and the pain of exposed nerves associated with conventional full or partial dentures are eliminated. As a result of losing one or more teeth, you inevitably lose bone mass in your jaw. This affects the overall skeletal structure of your face which not only changes your profile, but also may result in thin lips, drooping muscles, jowls or witch’s chin. Spreading bone loss in the jaw affects the gums and ridges in your mouth, as well as the muscles and nerves in and around the mouth. 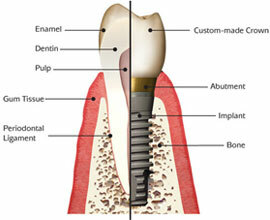 Dental implants prevent bone loss, because implants halt and even reverse the bone loss that results from losing teeth. Complete denture wearers on the other hand become aware of jawbone loss as their dentures become loose. People who lose one tooth, which is replaced by a bridge, may even be unaware that the jaw bone is dissolving. It is as if dental implants “trick” the bone into thinking there is still a tooth present. By transmitting the natural forces of chewing to the jaw, dental implants increase bone density. Dental implants have been proven not only to stop bone loss, but in some cases actually to reverse bone loss and restore the health of the jaw. By preventing the loss of the bony structure of the jaws and face they prevent facial collapse. This preserves your youthful appearance. No one will ever know that you have a replacement tooth. When replacing missing teeth with dentures, the teeth can slip and slide around the mouth. The facial muscles become tense in an attempt to hold the teeth in place. This often results in mumbling, slurred speech or clicking noises. Dental implants allow you to speak with confidence in a relaxed and natural tone. Dental implants restore chewing efficiency comparable to that of natural teeth. Therefore, patients with dental implants can eat a wide range of food items with less difficulty, and experienced less impact on daily life than patients with dentures. In addition, a full upper denture covers the palate of the mouth and reduces the ability to taste foods. With dental implants, you can have the palate removed from your upper denture so you can taste and enjoy your food. Since dental implants look, feel and function like natural teeth, you will have a new set of teeth or a new tooth that will greatly improve the cosmetic appearance of your smile. Dental Implant – Who Is a Candidate? In general, anyone missing at least one tooth and healthy enough to undergo routine dental treatment, including tooth extraction, is probably able to undergo dental implant treatment. There are some medical conditions that warrant special consideration before placing dental implants. Certain chronic diseases, heavy smoking or alcohol abuse may contraindicate dental implant treatment. If you already wear dentures but are psychologically uncomfortable with them (e.g. You lack confidence due to the appearance or poor fit of your false teeth) or find them physically difficult (e.g. You cannot taste food properly due to the dentures), you should consider implants. You are never too old to get dental implants. There are two things to keep in mind, however, when considering dental implants. First, they may not be covered by your dental insurance, although that is currently changing. Second, you will need to have the patience to wait three to eighteen months for the entire dental implant process to be completed, depending on the type of restoration that will best serve your needs. Dental Implant – What are the Costs? Most people assume that a dental implant treatment is more expensive than alternative methods of tooth replacement. In reality, dental implant treatment is actually more cost effective other methods of tooth replacement. The basic reason for this cost differential is due to the fact that other treatments require extensive repairs, replacements, and procedures to preserve the integrity of facial structures and prevent additional tooth loss compared to dental implants. In other words, additional procedures will probably be necessary in the future to treat the teeth that were cut down, repair the resulting bone defects, or replace the initial bridge. One bridge replacement and a procedure to repair the bone defect could increase the total cost of treatment to over $6,000 in a 10- to 15-year period. A dental implant supported crown, on the other hand, could cost significantly less.